The 4-1/2” American−Darling® Mark 73−5 fire hydrant, by AMERICAN Flow Control, incorporates more than 100 years of experience in design, manufacture and field experience. This means dependable and efficient operation when needed. Introduced in 1973, the 4 ½” American-Darling Mark 73−5 fire hydrant is AWWA rated at 250 psig and is seat tested at 500 psig. This fire hydrant meets and exceeds all requirements of ANSI/AWWA C502 for dry barrel fire hydrants. The 4-1/2” Mark 73−5 fire hydrant has all the features you expect from a high-quality fire hydrant. The all-bronze seat and bronze drain ring assure that the fire hydrant is easily repaired by just one person. The epoxy-primed and polyurethane top-coat system on the external surfaces on the upper barrel provides a durable, high-gloss finish that, under normal conditions, should continue to look good for years without repainting. The American-Darling 4-1/2” Mark 73-5 design has been manufactured for more than 30 years. 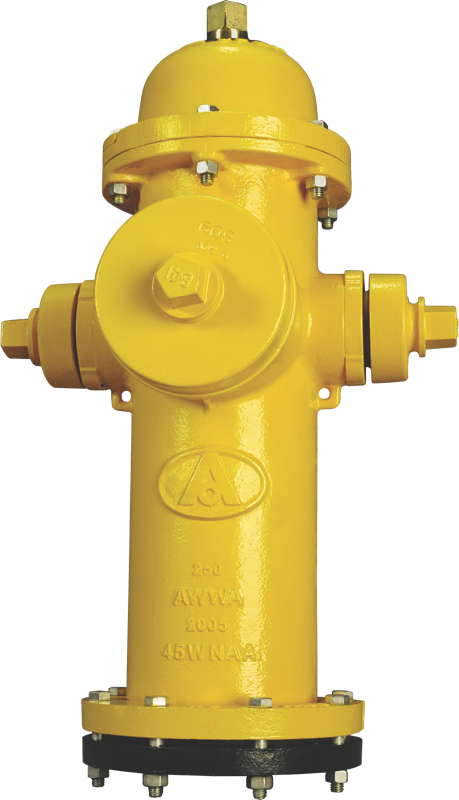 The American-Darling 4-1/2” Mark 73-5 fire hydrant is UL Listed and Approved by FM Approvals in applicable configurations. The American-Darling 4-1/2” Mark 73-5 fire hydrant is Certified as complying with NSF/ANSI Standard 61 and NSF/ANSI 372, which exhibit compliance with the U.S. Safe Drinking Water Act.